Google’s Street View is one of those amazing things we take for granted. At the tap of a button we can be transported to millions of places around around the globe and take a 360-degree look around as if we were standing right there. And now Google wants to put the power of Street View right in your hands. On its Keyword blog, Google has announced a new "Street View ready" certification standard that will let anyone publish an interactive tour fit for Maps. Previously, creating 360-degree videos required a rental of the cumbersome Google Trekker or some serious video know-how, but the new program looks to make it easy and friendly to upload your own interactive experiences. 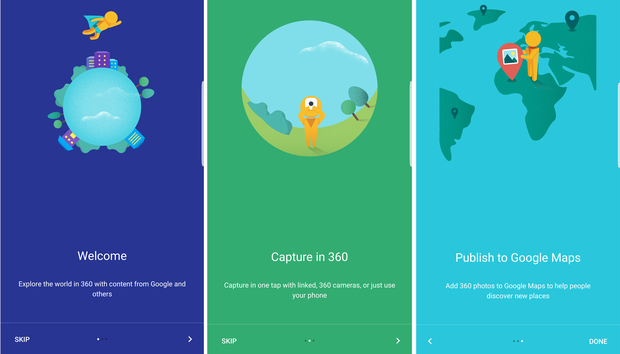 As Google says, the new program will allow anyone to shoot and upload their videos "while we do the heavy lifting of connecting each frame of your video into a traditional, interactive Street View experience." Street View Mobile Ready: 360-degree cameras that can publish Street View directly from a mobile app, without requiring a desktop workflow. Supported camera include models from Giroptic, NCTech Ltd., 360Fly, and KenXen. Street View Auto Ready: 360-degree cameras tailored for vehicle-based collection with the highest accuracy. Supported cameras include models from Sphericam, Z Cam, Insta360, and NCTech Ltd.
Street View VR ready: 360-degree cameras or systems that collect geometry in addition to generating sets of connected 360 photos. Supported cameras include models from Matterport, NCTech, and InsideMaps. Street View Workflow Ready: Publishing tools, sometimes bundled with cameras, that can upload to Street View accounts. Supported companies include Samsung, GoPro, HumanEyes Tech, iGuide, GoThru, Garden Gnome, and Panoskin/LCP360. The most recent update to the Street View app was on April 21, but presumably Google will begin rolling out a new version once these cameras begin hitting the market. The impact on you on the road: Google Street View is a fantastic tool for learning about and just plain admiring far-away places. But this new 360-degree push aims to turn it into a mass-scale operation, with places being regularly updated as the landscape changes. While it remains to be seen whether this will spur people to run out and buy 360-degree cameras before their next vacation, it’s certainly an interesting project to keep an eye on.